Copyright: You authorize this submission of Work to be reproduced, displayed and/or distributed by INFOCUS in whatever form it chooses, whether as a physical exhibition, digital catalog, website, printed material, for promotional or other purposes. 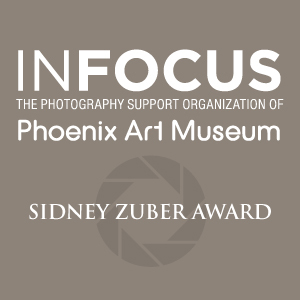 INFOCUS, the photography support organization of Phoenix Art Museum, is calling for entries for the first INFOCUS Sidney Zuber Photography Award. The award will be granted biennially to an emerging or early career photographer who demonstrates artistic promise. The artist selected for the INFOCUS Sidney Zuber Photography Award will receive an unrestricted cash award of $5,000. The award winner will also be honored at a reception at the Museum on May 20, 2015, and will be reimbursed up to $1500 for travel expenses to attend. Applicants are required to submit a brief artist’s statement and a URL for the applicant’s website, or another source where work can be viewed online, such as a social media page. Artists may submit up to five digital images online via the website. Image requirements: JPEG format only; No smaller than 1920 pixels on the longest side; 72 ppi/dpi (standard web resolution); 5 MB maximum in file size.